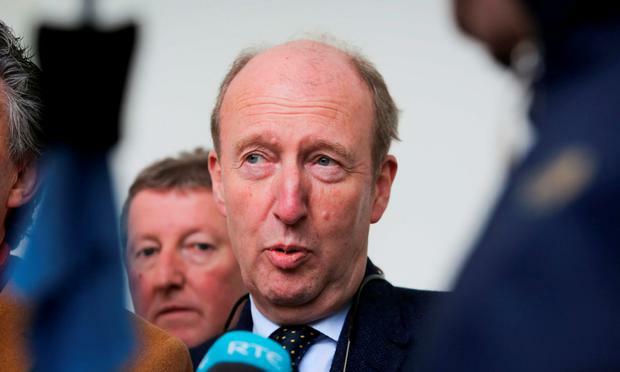 Is Shane Ross serious about his role and responsibilities at Cabinet and specifically as Transport Minister? It's a legitimate question to ask following the revelation in this newspaper that Ross has objected to a new development of just 63 housing units in his own constituency. That objection, by any measured consideration, runs contrary to the spirit and the substance of the Government's action plan for housing and homelessness, 'Rebuilding Ireland', launched with much fanfare a few weeks ago. In that plan, Housing Minister Simon Coveney boldly stated that the Government's "mission is to ensure that everyone can access a home, either on their own or with State support", adding: "We are determined to deal with the dramatic under-supply of housing and the problems it generates for families and communities." Unless, it would seem, that "accessing a home" or "dealing with under-supply of housing" is in the backyard of the constituents of one of the ministers at Cabinet. Ross's objection to the proposal to build nine homes, 24 duplexes and 30 apartments beggars belief in the context of what the action plan is supposedly determined to achieve. What's proposed on the 1.1 hectare site at the back of Oatlands College in Stillorgan - on the southside of Dublin - is relatively modest and entirely reasonable. An argument could perhaps be made against the overall height of the apartments in the development. But, that aside, the proposal is exactly the kind of development, in a much sought-after urban setting with excellent transport links and local infrastructure, that any government would want to encourage. Of course, local residents are not going to be happy about the development. They, understandably, want things to remain as they are. And that's reflected in the huge number of objections to the proposal. And, of course, they have a right to make those objections. As do the many local politicians, including Fine Gael TD Josepha Madigan, who have joined in those submissions. But that doesn't mean they are right. And, as a Cabinet minister in a Government supposedly on a mission to tackle the national housing crisis, Ross has to be held to a higher standard than those other politicians. But in this instance, at least, he comes up short. He cites four reasons for objecting to the proposal. The final one - relating to the protection of trees - doesn't warrant elaborating on here, as it will inevitably be sorted out at the planning stage. None of the others remotely stand up to scrutiny. The minister firstly argues the development takes no account of the impact on primary and post-primary schools in the area. He cites the guidelines laid out in the Department of Environment's 'Sustainable Residential Development in Urban Areas', which states that no substantial residential development should proceed without an assessment of local school capacity. The problem is that this isn't a "substantial residential development". It's basically an infill development. Given that just 33 houses are planned, we're probably talking about an extra 60 children ultimately living in the area. If Stillorgan, a few miles from the centre of the country's capital city, can't cope with an extra few dozen pupils over a number of years, then we are in serious trouble. Ross's second reason for objecting - his claim that potential residents would not be able to access medical services in their locality - is equally risible. His third point is one that is made in virtually all of the 200 or so objections - that the density of the development is far too high. The minister once again cites the sustainable residential development guidelines which he says recommends "densities in the general range of 35-50 dwellings per hectare", complaining that this development proposes a development of 56 units per hectare. However, the reality is that the same guidelines also specifically allows for higher densities within transport corridors - and this site, just a few hundred yards from the Stillorgan Road/N11 Quality Bus Corridor, is within a transport corridor. Just in case there was any room for doubt, the local county development plan points out that higher densities - "at a minimum of 50 units per hectare" - would be encouraged if developments are within a kilometre of a quality bus corridor. That's presumably why an earlier proposal from the site's developers, with much lower densities, was rejected by county planners at preliminary meetings. It's puzzling that the Transport Minister would, firstly, not seem to be aware of this and, secondly, would be opposing higher densities along the public transport networks he's in charge of. That runs contrary to good public policy and, well, common sense. Of course, Ross is not the first - nor will he be the last - minister to object to a housing development that is unpopular in the constituency. All politics is local and all that. But coming so soon after the very welcome apparent urgency of the housing action plan, his objection to the kind of development that would be the norm in cities across Europe, and should be the norm here, is hugely dispiriting. It's also worth recalling that we were told Ross's Independent Alliance was "determined to change Irish politics fundamentally". So far, at least, we are seeing little sign of that with their ministers - on issues as diverse as water charges, abortion, prostitution and housing - looking to have their usual oppositionist cake, while eating it at the Cabinet table. And, other than being in power for power's sake, what's the benefit or the point of that?